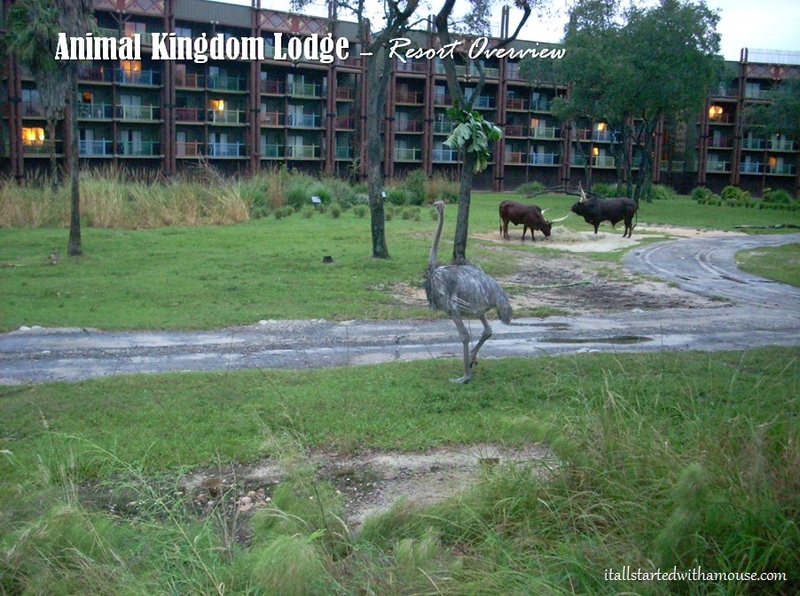 Animal Kingdom Lodge is one of the most unique resorts not only within the Walt Disney World Resort but in the world. It has 44 acres of savanna, and is home to a variety of different African wildlife. Short of being on safari in Africa, there is no where else where you can sit out on your balcony and watch giraffes, zebras, ostriches, gazelle, and other African savanna dwellers graze and interact. There are two different areas within the resort, Jambo House and Kidani Village. Kidani Village is a DVC resort and features deluxe studio and villa accommodations. Jambo House also has villas available. The lobby of Jambo House is truly breath-taking. The architecture is magnificent and immediately gives off a rustic African feel. Straight ahead when you enter is an enormous window out onto the savanna. Also located off the lobby is an awesome gift shop, full of African art, gifts, books, and more. From the lobby, there is a stairway that will take you down to the Victoria Falls Lounge which serves classic cocktails, beer, and wine and overlooks Boma. Right next to Boma, you will find Jiko and an exit out to the Uzima pool area and The Mara quick service dining area. There is nightly storytelling at the firepit or at Sunset Overlook. There are also Safari Guides around who can answer your questions about the animals on the savanna. Tip: It is absolutely worth it to pay a little more to get the savanna view rooms. Unless you are planning to only sleep in your room and be out in the parks, sitting out on the balcony and enjoying the scenery is amazing and definitely puts Animal Kingdom Lodge at the top of my favorite Disney World resorts list. Boma – Flavors of Africa is one of my husband’s favorite restaurants on property. They are open for breakfast and dinner, both serving a buffet style meal. The food is largely African themed, but they have some “safe” options for the less adventurous eaters in your family (macaroni and cheese, pasta). African dinner dishes include: pork shoulder, pap and chakalaka, spice-crusted beef striploin, whole roasted salmon, fufu, soups, salads and more! (See menus here) Reservations start 180 days in advance. Jiko – The Cooking Place is a gorgeous table service restaurant also located within Jambo House. The entrees are varied but cover chicken, beef, fish, lamb and vegetarian options. They also have a wonderful selection of artisanal cheeses and South African wines. (See menu here) Reservations start 180 days in advance. Sanaa is located within Kidani Village and sports a menu that is African with Indian flavors. The restaurant has a savanna view, so you can enjoy the animals while you are dining. The menu includes chicken, strip steak, fish, and shrimp curry. (See menus here) Reservations start 180 days in advance. Standard rooms at Jambo House have either 2 queen beds; 1 king bed and a daybed; or 1 queen bed and bunk beds. All rooms have a balcony, safe, TV, mini-fridge, coffeemaker, iron and ironing board, hairdryer, ceiling fan, and free wi-fi. Room service is available. There is a laundry facility on the first floor near Simba’s Cubhouse.